From the brilliant conception by Judy Folkmanis in the late 1960's, Folkmanis puppets have been designed around the belief that encouraging creative play and allowing a child to use their imagination is the one of the keys to a healthy childhood. 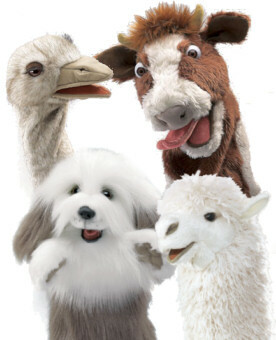 Recognized as one of the most renowned and well respected plush puppet manufacturers in the world, Folkmanis puppets has taken that concept and extended it to their entire line of over 200 of the most unique, well designed animal puppets available today. Folkmanis' line of quality puppets include a fanciful line of finger puppets that are perfect for packing along in a pocket for an impromptu puppet show. Dozens of larger, more intricately detailed animals - both real and mythical - populate the line of Folkmanis' stage puppets and full body puppets. Each puppet is crafted to allow ease of interaction, encourage hands-on discovery, improve motor and language skills, and create a sense of companionship. Stuffed Safari is proud to celebrate the creative nature of Folkmanis puppets by offering the full line of plush stage puppets, full body puppets, and finger puppets. Browse the collection below, or choose one of the special groups below to browse a sub-category. Be sure to check out some of the videos included on individual product pages for demonstrations on how much fun these puppets can be!